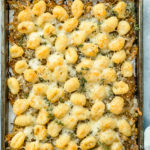 This French Onion Baked Gnocchi is made on one sheet pan! 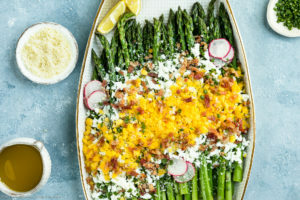 This super cheesy tray bake has all the classic flavors of french onion soup you love turned into a fork and knife, easy weeknight meal! I don’t know about you, but I absolutely love comfort food, especially during the winter season. I mean – rich, decadent, and reliable for a feel-good pick-me-up, what’s not to love about cozy, comfort food, right? 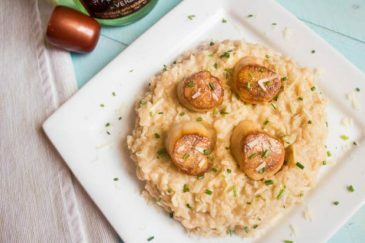 However, sometimes I want a lightened-up version of my favorite classic, decadent dishes. Don’t get me wrong, I still want the warm, hearty meal with copious amounts of cheese, just minus all the food coma bloat. This super cheesy sheet pan meal has all the classic flavors of french onion soup, just lightened-up and turned into a knife and fork, easy weeknight meal! 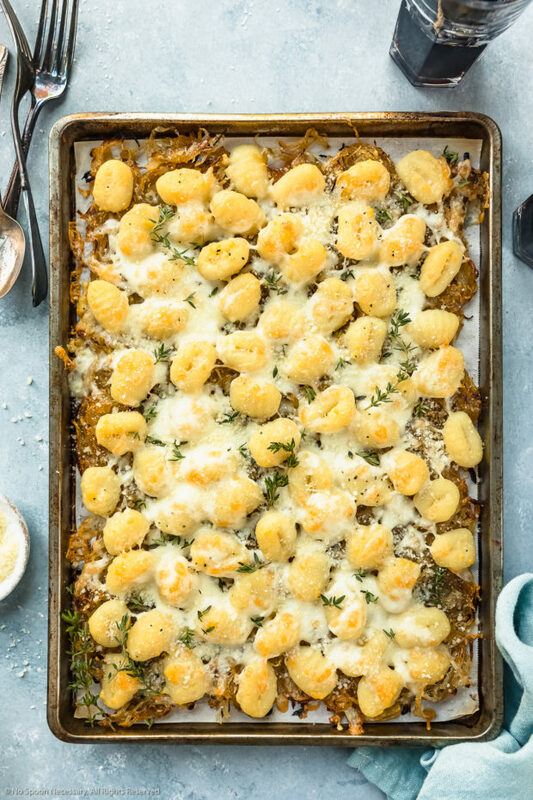 Fluffy gnocchi on a bed of tender, savory and candy-sweet caramelized onions studded with fragrant garlic; smothered with salty parmesan and gooey mozzarella. 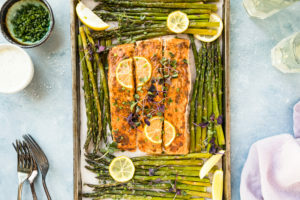 Baked until golden brown, gooey and delicious; then finished with a generous drizzle of silky, tart balsamic vinegar and a scattering of fresh, earthy thyme. This baked gnocchi is a hearty and satisfying, lightened-up way to enjoy comfort food! Basically, this is proof that healthier comfort food does exist! And, if that wasn’t enough to rock your world, this French Onion Baked Gnocchi is crazy easy to make! 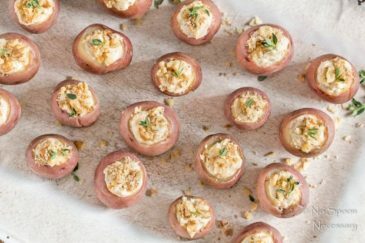 All you do is throw ingredients on a sheet pan and bake them in layers – starting with the onions and ending with cheese. Embarrassingly easy, right?! 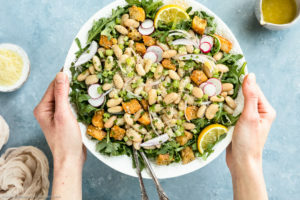 Oh, and if you are looking to add a little protein to this meal, simply add some chicken or sausage to a sheet pan and bake it right along side the gnocchi in the oven. I mean, is this versatile, or what?! Baked gnocchi is simply cooked (or shelf stable) gnocchi baked in the oven until the outside is golden and crispy and the interior is fluffy and creamy. Baked gnocchi can be made by either tossing gnocchi with olive oil and seasoning before baking on a sheet pan, or it can be made by baking the gnocchi in a sauce, much like a casserole. What to serve with baked gnocchi? How to eat sheet pan gnocchi? Baked gnocchi dumplings are absolutely delicious served on their own, or simply sprinkled with your favorite grated or shredded cheese. However, they also perfectly adapt to a variety of flavors! Can you freeze baked gnocchi? Yes, you can freeze baked gnocchi. 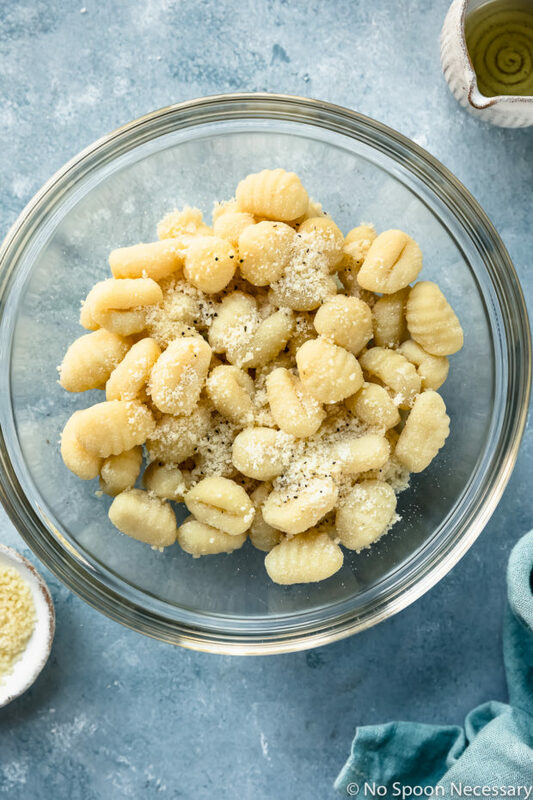 To freeze, allow the gnocchi to cool completely before transferring them to a freezer-safe zip-closure bag. Cooked gnocchi will keep in the freezer for up to 6 weeks. How to reheat baked gnocchi? There is no need to thaw frozen cooked gnocchi before reheating. To reheat, sauté gnocchi in a hot skillet (with a bit of butter if desired) until crisped and heated throughout. This recipe uses shelf-stable (versus frozen) gnocchi. I normally use DeLallo Potato Gnocchi. You should be able to find gnocchi in pasta aisle of most major grocery stores. 4 onions will seem like a lot on the baking sheet, but do not be alarmed. Onions will cook down by a ton (they will shrink to about a 6thof the amount). If you don’t like roasted garlic, feel free to discard the cloves when you discard the thyme sprigs or you can keep them whole. I removed the cloves, thinly sliced them and then tossed them back in the onions before serving. 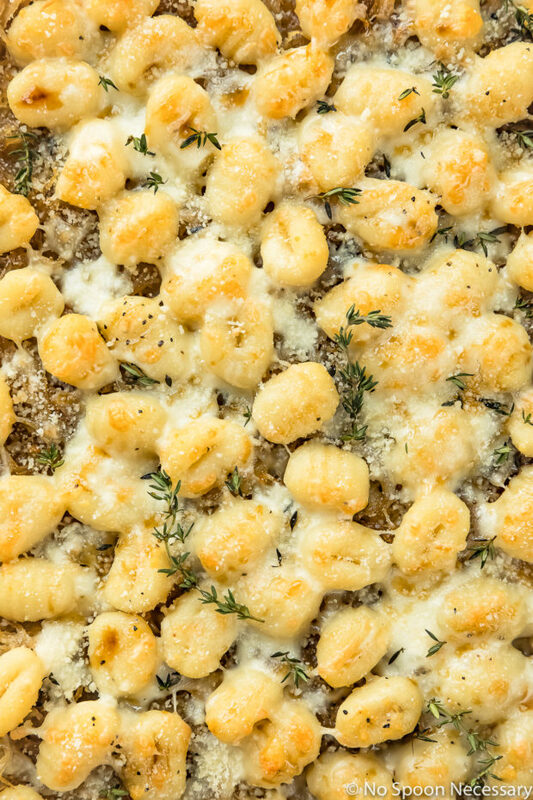 This French Onion Baked Gnocchi will be your new obsession! 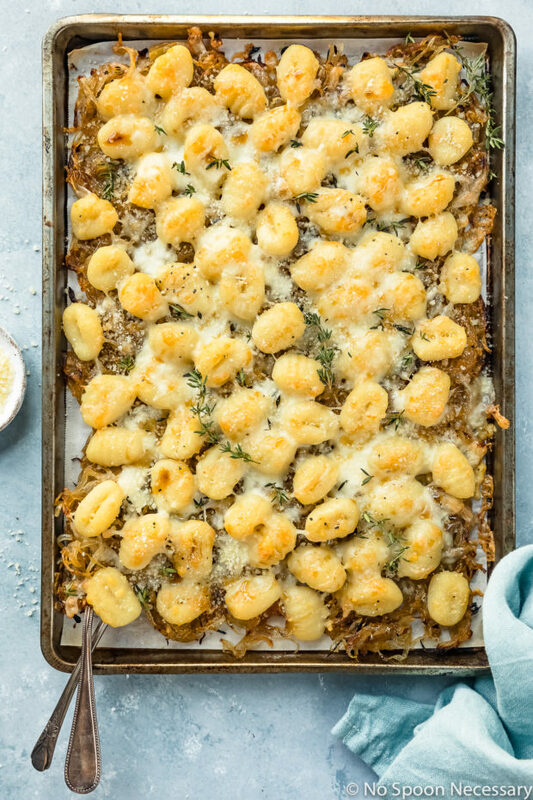 With sweet caramelized onions, fluffy gnocchi and all the gooey cheese, this easy weeknight meal is sure to be a hit! Until next week friends, cheers – to lightened-up classics with a twist! 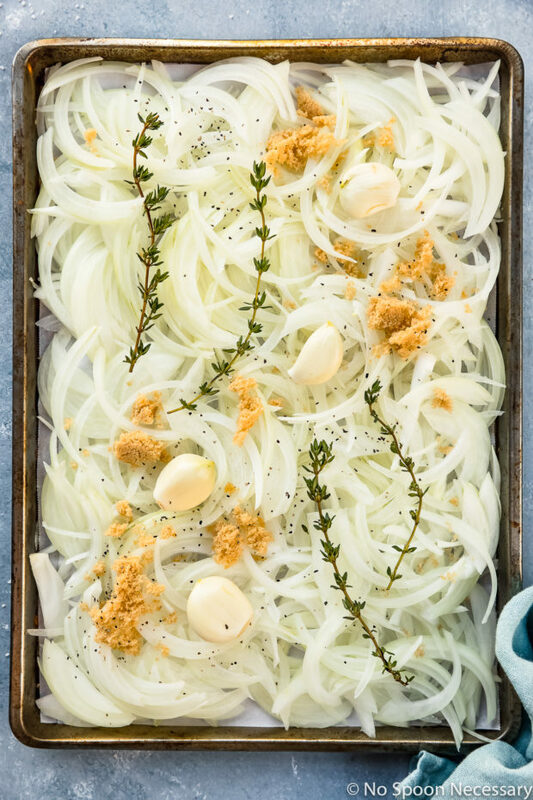 Toss onions: Place onions, garlic and thyme on a large, rimmed sheet pan. Sprinkle with brown sugar, drizzle with 5 tablespoons of oil and season generously with salt and pepper. Toss everything together until evenly coated. Caramelize onions: Cover the pan with foil and roast in the oven for 55 minutes – 1 hour and 10 minutes, or until softened and golden in color, removing onions from the oven and tossing the onions 3-4 through roasting*. Remove the pan from the oven and discard thyme sprigs*. Drizzle onions with Worcestershire sauce and toss to combine. Increase oven to 450 degrees F.
Toss gnocchi: In a medium bowl toss the gnocchi with remaining tablespoon of oil and grated parmesan. Season with salt and pepper. Toss to combine. Add gnocchi to pan: Sprinkle the gnocchi evenly over the onions. 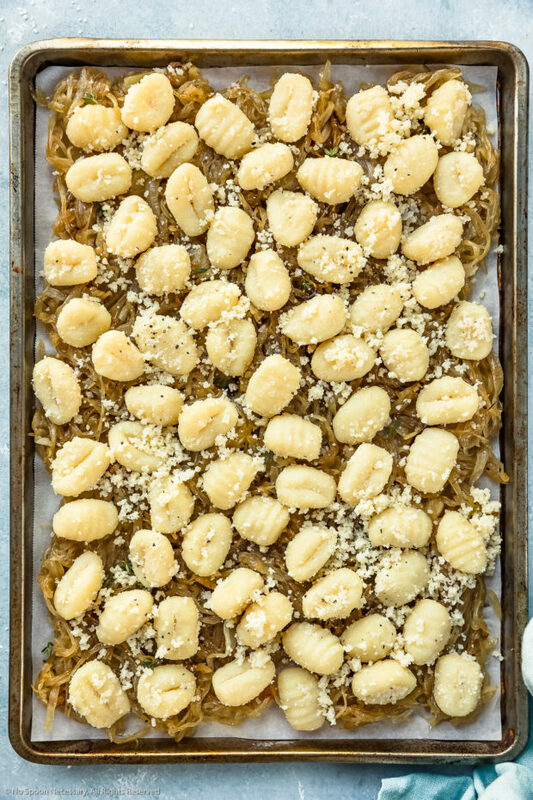 Return the sheet pan to the oven and bake for 12-13 minutes, or until the gnocchi are almost tender. 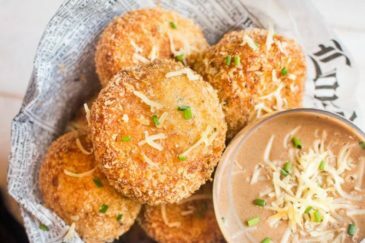 Add cheese: Remove from oven and top with the mozzarella cheese. Switch oven to broil, return pan to oven and cook until the cheese is melted and gnocchi are golden, about 4 minutes. Serve: Drizzle with balsamic vinegar and sprinkle with parmesan cheese and fresh thyme. Served with toasted, crusty bread and enjoy! Wow, this is a clever way to serve Gnocchi, Cheyanne. 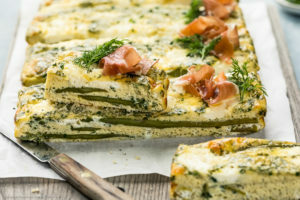 One pan dishes are my favorite and you are a master at the one pan recipes. Looking forward to trying this. Have a great weekend! Comfort food is everything right now! I’m not even in a hurry for spring because I love being all cozy and snug with my favorite comfort foods. These gnocchi look wonderful and so flavorful. A brilliant method of cooking them! Somehow I have never baked gnocchi, but clearly I need to! My mouth is literally watering! This is a one-pan wonder! What a fun idea for a dinner party or any day of the week! This is guaranteed to rock my world Chey! 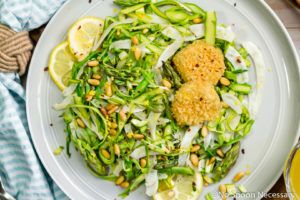 I absolutely adore gnocchi! And add caramelized onions and I’m so in!! I just bought some gnocchi too, and haven’t decided what I was going to do with it! Decision made! Can’t wait to try your recipe. Hope you have a wonderful Valentine’s Day Chey! 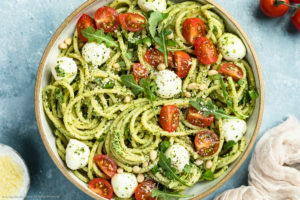 I do like comfort food too (Well technically I can live without most of comfort foods during the winter season, but I’ll never give up on hearty (thick) soup, pizza, pasta, and my recent addiction – gnocchi. Did I cover most of possible comfort food?) 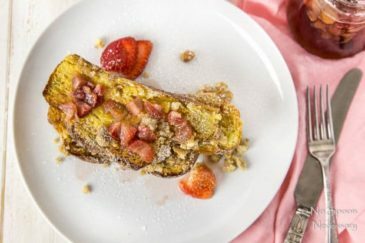 This recipe looks and sounds fantastic! It is also relatively healthy and light dish, so I’ll have two servings 🙂 Thanks! I am not even sure that I have ever had some baked gnocchi! This looks super duper delicious and comforting.